Thanksgiving is a holiday to remember the pilgrims and to give thanks. Thanksgiving lands on the fourth Thursday of November and is time to celebrate and give thanks with your family and friends. Here are some of the most common ways that you can use Thanksgiving banners. Lots of towns and cities have parades on Thanksgiving. If you are having a float, you can put a banner on your vehicle or trailer in the parade. You can also use signs for registration booths, entrances, exits and bathroom locations. One of the most common ways to celebrate Thanksgiving is with a Thanksgiving meal. There are also lots of Thanksgiving food drives to help the homeless. You can use a banner to let people know about your food drive. 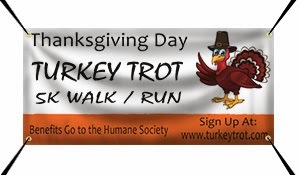 If you have a Turkey Trot on Thanksgiving morning you can use banners to advertise for the event. You can hang up banners before the event to let people know how to register and where the Turkey Trot will be held. On the day of the Turkey Trot you can hang up registration banners, start line banners and finish line banners. If your church has any Thanksgiving events you can put up a banner to let people know when the event is. You can also have banners hanging up in your church that say "Give Thanks" during your worship. There are lots of Thanksgiving craft fairs and festivals. Banners can be used to advertise for the event. If you have a booth at the craft fair you can put your business name and contact information on a banner. If you want to wish people a happy Thanksgiving, you can also display a banner at your business, church or in your yard. 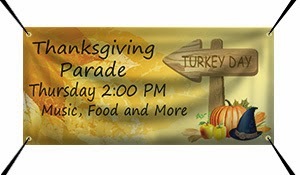 We have lots of Thanksgiving banner templates available for you to customize. Click here to get started.